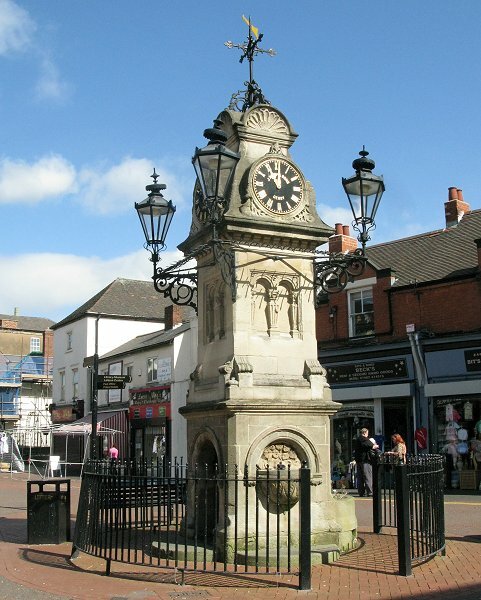 One of Willenhall’s most famous landmarks is the memorial clock in Market Place. 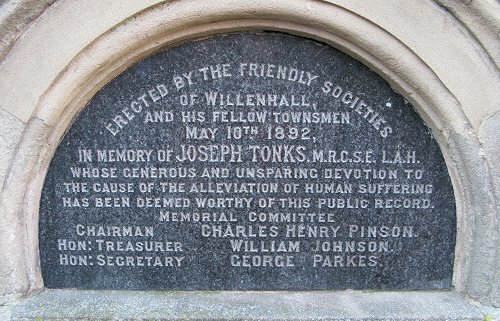 It is dedicated to the memory of Doctor Joseph Tonks M.R.C.S.E. L.A.H., a native of the town, born in Spring Bank on 5th May, 1855. 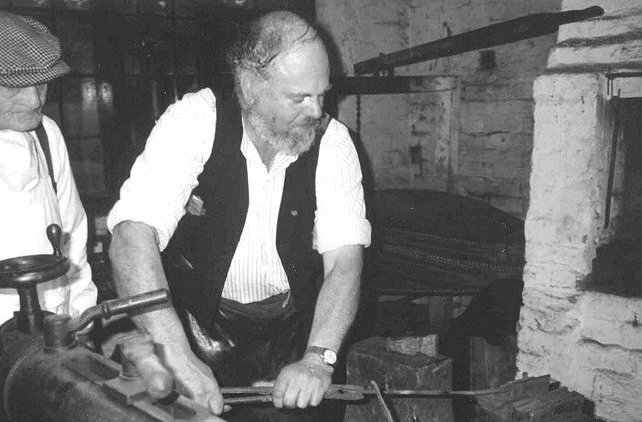 His father, Silas Tonks was a master padlock smith, and landlord of the Forge Tavern, Spring Bank. After studying medicine at Queen’s College Birmingham, he returned to Willenhall and started his practice in Wolverhampton Street. He soon took over the practice of the late Doctor Pitt at 3 Walsall Street, and did what he could to improve the lives of the poorer members of society, for which he became known as ‘the poor man’s doctor’. The plaque on the memorial clock. His short life ended on 2nd April, 1891, a few weeks before his 36th birthday, as a result of injuries received in a balloon accident in August 1888. The flight took place in the grounds of the Central Schools in Stafford Street, during the Willenhall Horticultural Society’s annual show. Gusts of wind caused the pilot to loose control of the balloon, which hit some nearby chimneys. 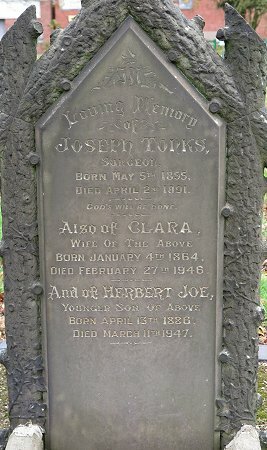 Although Joseph Tonks' injuries were not seen as life threatening, he never fully recovered, and his health gradually deteriorated. The doctor was buried in Wood Street Cemetery on the 7th May, 1891. 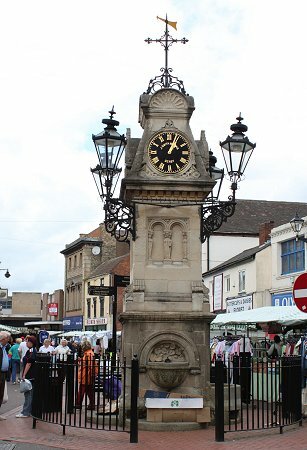 The clock, with its drinking fountain, and water trough was built thanks to generous donations given by the friendly societies, and a large number of local people. It was unveiled on 10th May, 1892. Doctor Tonks' grave in Wood Street Cemetery. 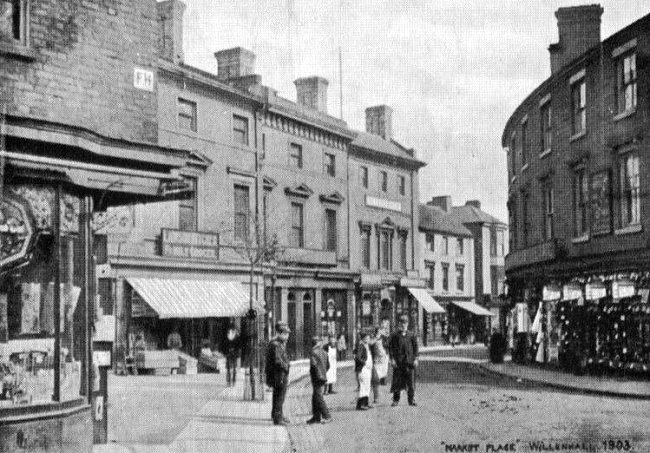 A late 1920s view of Walsall Street. 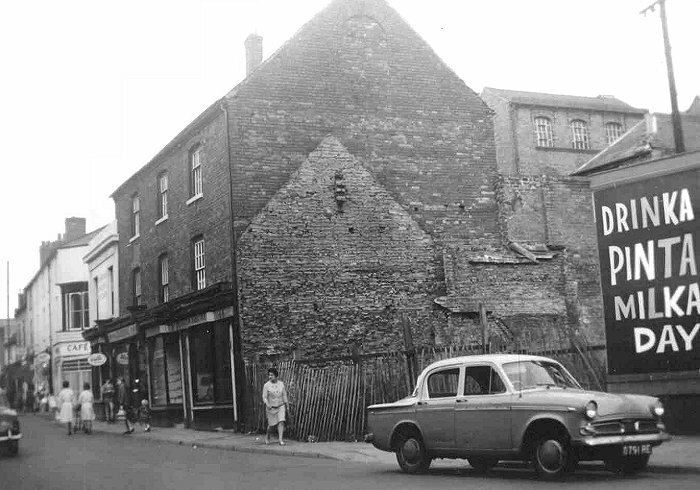 An earlier view of Walsall Street, looking towards New Road. 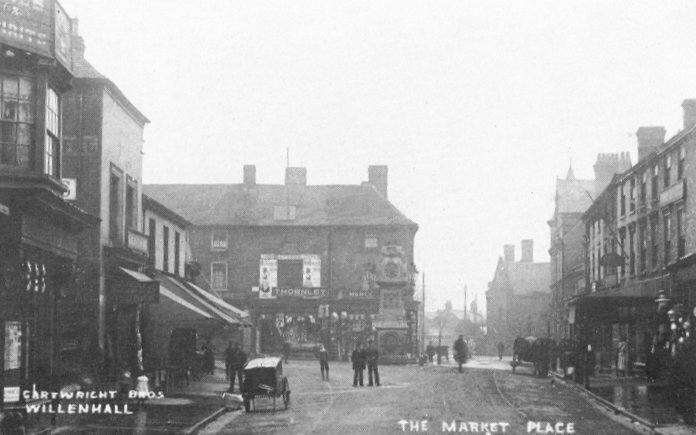 The Midland Bank and Market Place. From an old postcard. 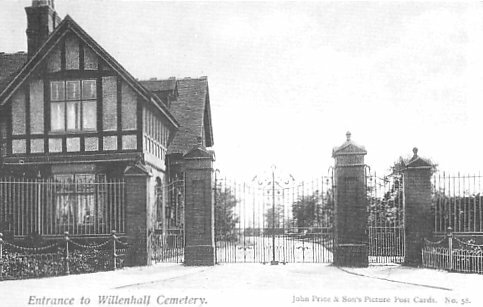 By the late 19th century, Willenhall’s graveyards were rapidly running out of space, and a new cemetery became a necessity. 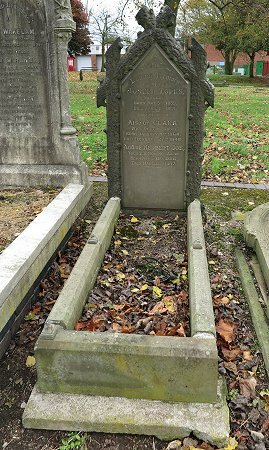 It was decided to build a cemetery on farm land in Wolverhampton Road West, Bentley, acquired from the Earl of Lichfield in 1894. The new cemetery was designed by the town surveyor, Mr. B. Baker, who planned the site to include a mortuary chapel, and a sexton’s lodge. Work started on the site in July 1896, and was carried out by Mr. Owens of Wolverhampton. During the following year the site had been prepared, and drainage work undertaken. The chapel, lodge, and walls were constructed by Mr. Thomas Tildesley, who began working at the site in July, 1897. The new cemetery was officially opened by Thomas Nicholls J. P., Chairman of Willenhall Urban District Council, on the 16th July, 1900, in front of a crowd of around 2,000 spectators. 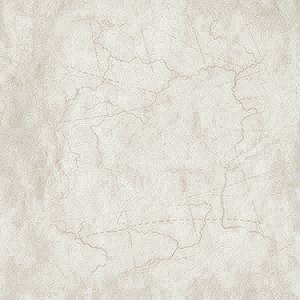 The final cost of the project was £7,725.12s.0d. Somewhat more than had been previously expected. Many Willenhall men joined the army, and fought in the Boer War in South Africa between 1899 and 1902. Twenty three of them lost their lives. They joined the following regiments: the South Staffordshire Regiment, the Shropshire Light Infantry, the Worcestershire Regiment, the Imperial Yeomanry, the North Staffordshire Regiment, and the East Kent Regiment. They are recorded on two plaques at the back of Willenhall War Memorial. 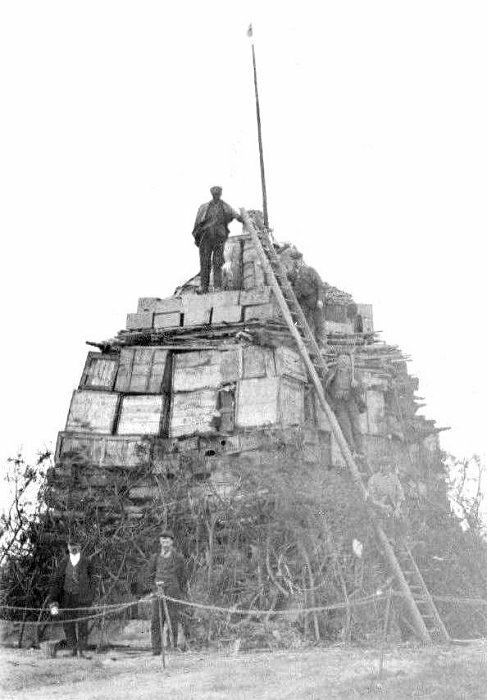 The bonfire built to celebrate the Coronation of King George V and Queen Mary, on the 22nd June, 1911. The stadium, which was built on the north side of Temple Road, opened on Monday 4th September, 1905 with a match between Birmingham (now Birmingham City) and the Willenhall Swifts. It was watched by a large crowd who saw Birmingham win by 3 goals to 1. The ground became the headquarters of the Swifts and continued to be so until the First World War. 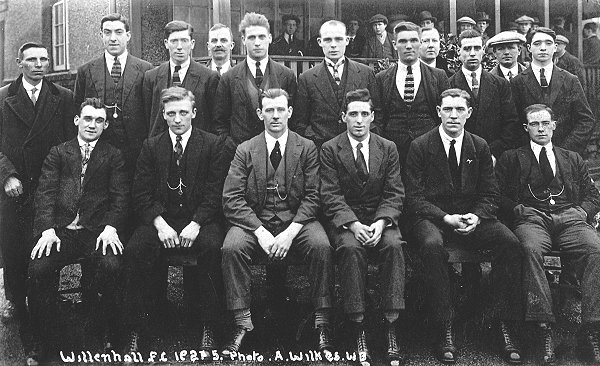 The last match before the war intervened, took place on the 30th October, 1915 between the Swifts and their local rivals, the Willenhall Pickwicks. After the war the two teams amalgamated to form Willenhall Football Club, with Spring Bank Stadium as their headquarters. The new club played its first game on the 26th April, 1919 at Walsall, with a return match at Spring Bank the following week. The team played in the Birmingham and District League and won the league championship in 1922. By 1930 the number of spectators had drastically fallen, and the club found itself in financial trouble. The club went into voluntary liquidation, and Spring Bank Stadium was sold and converted into a greyhound track. Greyhound racing continued on the site until 1980 when the owners, Ladbrokes decided to close the stadium because of falling attendances. It was sold to Barratts, who demolished the stadium and built around 100 houses on the site. It is commemorated in the names of a couple of the streets that were built on the site; Stadium Close, and Circuit Close. Willenhall’s present football team, Willenhall Town was formed in 1953 and plays at its site in Noose Lane. When war was declared on 4th August, 1914 large numbers of Willenhall men joined the local regiments and soon found themselves fighting abroad, in France, Belgium, and as far afield as the Dardanelles. Many of them lost their lives during the fearsome fighting in the trenches at the Somme, and at Ypres, Paschendaele, and the Gallipoli Campaign. They are remembered thanks to the war memorials at Portobello and Willenhall. 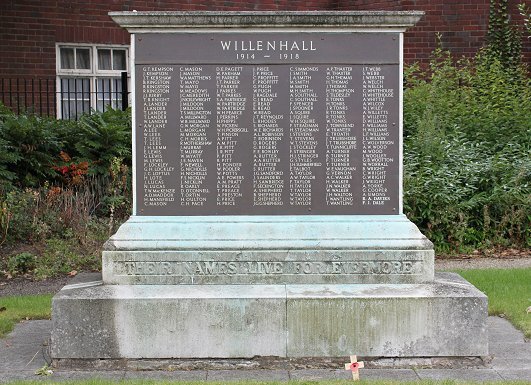 312 names are recorded on the Portobello war memorial, and 445 names are recorded on the Willenhall memorial. The people of Willenhall are well known for their generosity. During the war they collected £204,309 for the war effort. As the war progressed, local manufacturers received orders for war work from the Ministry of Munitions, and produced many items including gun parts, shells, hand grenades, and horse shoes. 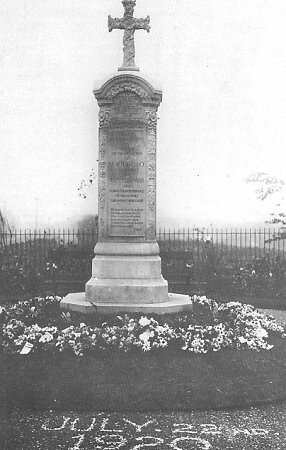 The Portobello war memorial. From an old postcard. A photo from an old postcard celebrating the collection of £204,309 during Willenhall War Weapons Week. Enough to buy 81 aircraft. 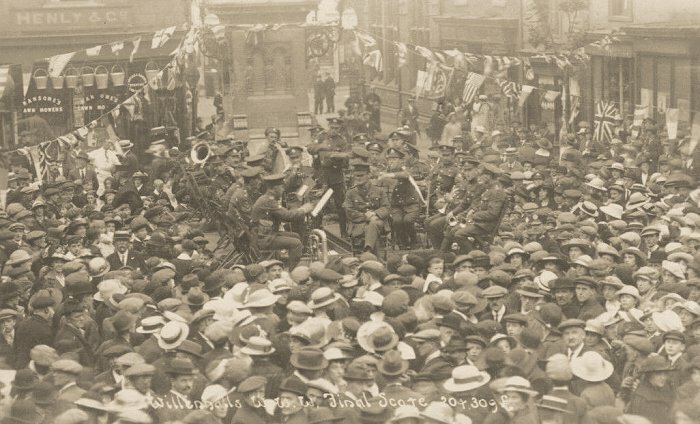 An old postcard showing some of the celebrations in the Market Place at the end of the First World War. 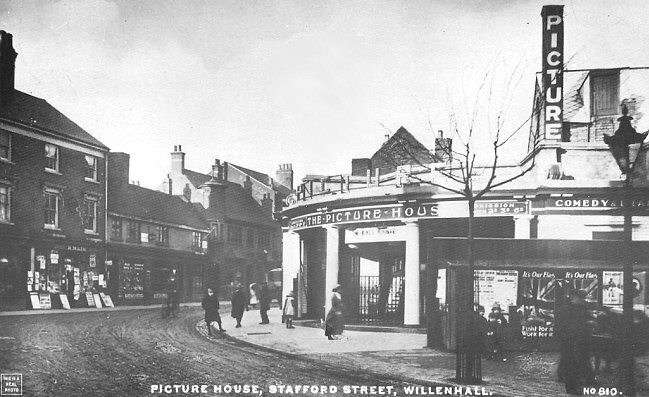 Willenhall's first cinema, the Coliseum, opened in 1914 in the old Hincks family’s malthouse on the corner of Bilston Street and New Road. This was soon followed by the opening of a second cinema, the Picture House, which opened in Stafford Street on the 19th April, 1915. The Picture House was a purpose-built cinema with first class facilities, whereas the Coliseum was housed in a not very suitable building, with inferior facilities. The Picture House was the more successful of the two, particularly when ‘the talkies’ arrived. When Mrs Price, the last member of the Hincks family, died, her estate, including the Coliseum was put up for sale. It was purchased by John Tyler, a local councillor, builder, plumber, and decorator, who with his daughter Norah, decided to replace the cinema with a modern state of the art design. 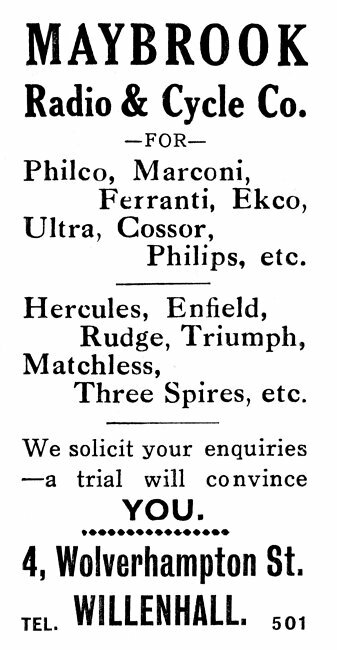 An advert from 1937. The building became the Dale Cinema, seating 1,150 people, including 250 on the balcony. It opened on the 31st October, 1932 with a showing of ‘Viennese Nights’, in Technicolor, with high quality Western Electric sound. Norah Tyler continued to run the cinema until her death in 1945 when it was acquired by J. L. and A. H. Brain who ran a cinema at Aldridge. 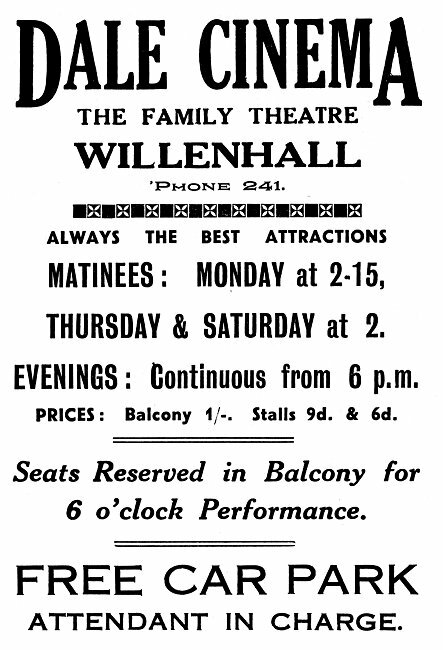 With the increased popularity of television, cinema audiences started to dwindle, and Willenhall, like many other towns eventually lost its cinemas. The Picture House closed on the 2nd May, 1959 and was demolished in 1961. The Dale continued in operation until the 30th December, 1967, then reopened as a bingo hall on the 16th February, 1968. In the late 1990s it was converted into a public house, and is now appropriately named ‘The Malthouse’, a J. D. Wetherspoon’s pub, which opened on the 21st December, 1999. 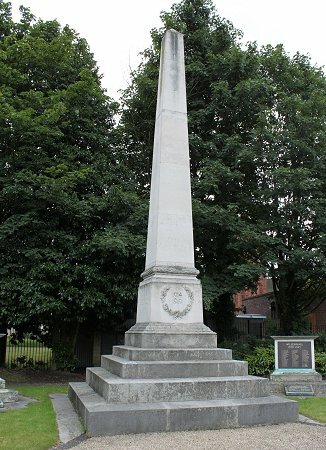 The Willenhall War Memorial. 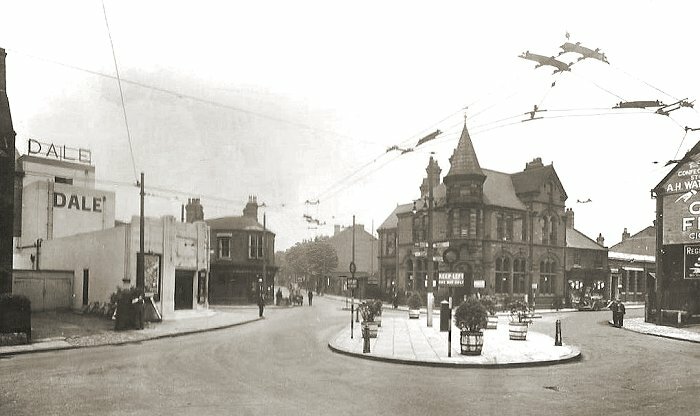 Willenhall’s War Memorial on the corner of Stafford Street and Field Street was officially opened on the 30th September, 1920 by Lord Dartmouth. The memorials were dedicated by the Reverend H. P. Hyatt on the 4th June, 1922. There are two plaques commemorating those who died in the First World War, and a large and small plaque commemorating those who died in the Second World War. Two other plaques set in the boundary wall commemorate those who died in the Boer War. In between them is a small plaque stating that the tablets were moved to the war memorial in 1964 having been removed from the gate piers at Wood Street Cemetery. One of two plaques dedicated to those who died in action in World War One. The memorial for those who died in World War 2. The local population steadily increased during the 19th century and the early years of the 20th century, so that new houses were badly needed to reduce overcrowding, and to improve living standards amongst the poorer members of society. 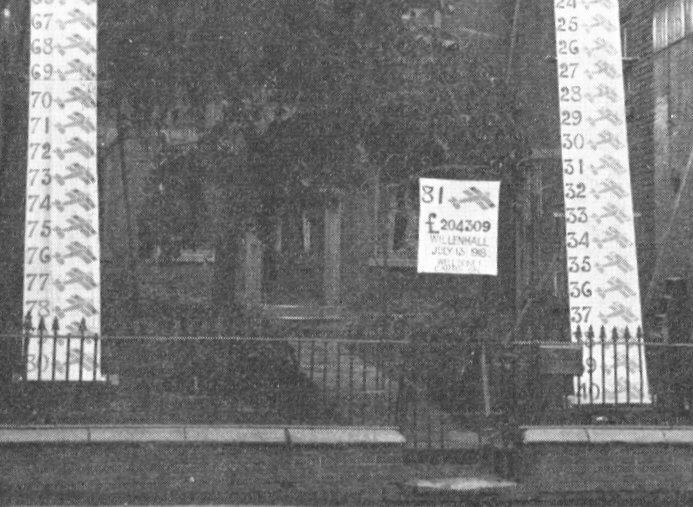 The council’s Housing and Town Planning Committee held its first meeting in November 1918 and considered the possibility of buying land for new housing. The 1919 Housing Act gave local authorities the responsibility to provide suitable housing for the expanding working class population. 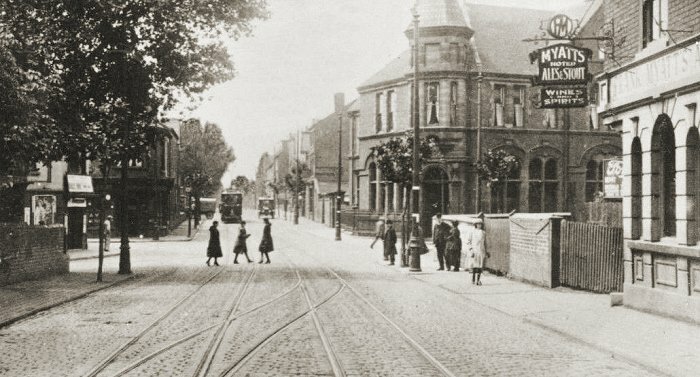 In August 1919 the council purchased land in Temple Road for the building of 74 council houses, which were to be the first council houses in the town. Over the next few decades, thousands of council houses were built throughout the town, and much of the open land disappeared. 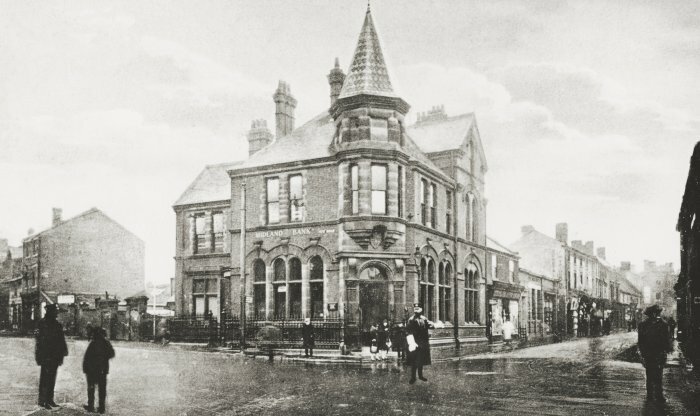 The houses were built in many areas including Spring Bank, Wolverhampton Road, the southern side of the Memorial Park, and the area to the east of Rose Hill. Willenhall Football Club. Date unknown. Courtesy of Tony Highfield. In 1931 Willenhall lost its passenger train services at Stafford Street railway station when the LMS withdrew passenger services on the old Midland line. The railway remained open for goods until the 1st November, 1965. Although fewer lives were lost during the Second World War, its impact was just as great as the previous conflict. In September 1940 the council launched an appeal called ‘The Willenhall Fighter Aircraft Fund’. It raised £6,750 to pay for a Spitfire aircraft which was presented to the government on behalf of the local people, and named ‘Willenhall’. A few weeks later Willenhall directly experienced the might of the German Luftwaffe during the town’s first air raid. On the 20th November, houses were destroyed in Ward Street, Ann Street, and Springvale Street, and St. Anne’s Church was slightly damaged. 12 people were killed, and many were injured, or left homeless. The homeless were initially cared for by the Salvation Army at the Citadel in Moat Street. Those killed were: Clara Bird, Ronald K. Bird, Thomas Bird, Joyce Fox, Frederick Jones, Lily Jones, Mary Jones, William Moreton Jones, Joseph Lockley, Geoffrey Morris, George Morris, and Owen Morris. There was a second air raid on 31st July, 1942, this time on the Wolverhampton to Walsall Road. It seems that German aircraft were following the railway line, and dropped bombs en route. Four people were killed, and several houses and part of a factory were destroyed. Those killed were Beatrice Farrington in Peel Street, Ada Maria Handy in New Road, Joseph Richard Dudgon in Wolverhampton Road, and Charles Henry Banks, also in Wolverhampton Road. The civilian dead from the air raids were buried in a special part of Bentley Cemetery. During both air raids the enemy aircraft were fired on by the anti-aircraft guns that were set up on an area of land between Ashmore Lake and Broad Lane South, known as the Five Fields. There were several large guns, searchlights, and radar which were manned by members of the Anti Aircraft Regiment. The site was totally unsuitable, being heavily waterlogged in the winter months, and so the battery only stayed for part of the war. 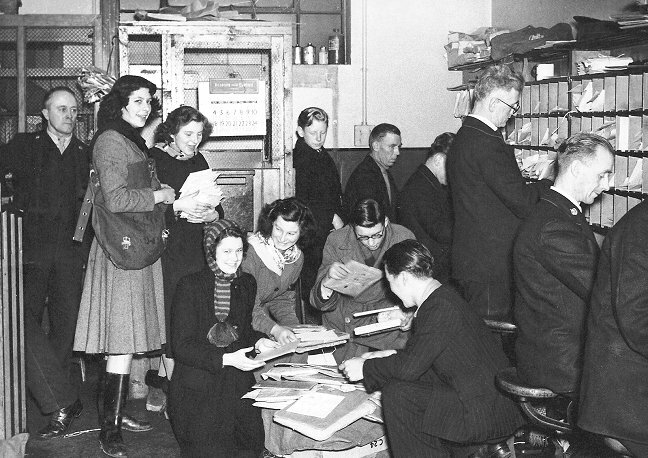 During the air raids, help was provided by the 100 or so volunteers in the Willenhall section of the Women’s Voluntary Service, and the town’s Civil Defence Services. 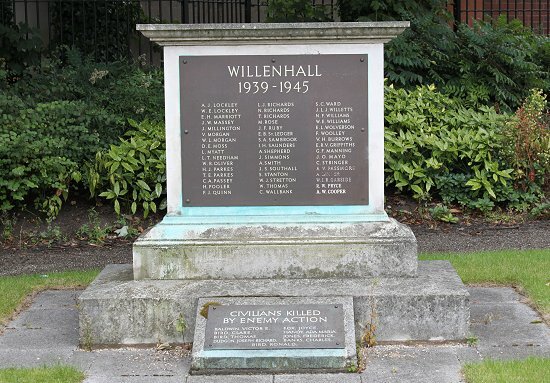 The Willenhall Fire Service also helped out in the aftermath of air raids at Birmingham, Coventry, Liverpool, London, Manchester, and Plymouth. Willenhall war memorial contains a plaque listing 93 names of members of the armed forces who were killed by enemy action during the war. Although the number is far less than in World War One, it still had a huge impact on the town. 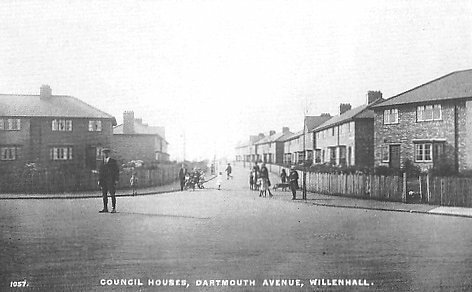 After the war, Willenhall continued as a busy, successful industrial town, much like its neighbours. In January 1965 the town lost Bilston Street railway station when the line was closed to passenger traffic. An even more important event happened the following year as a result of the Local Government Reform Act. Despite much local opposition, Willenhall lost its status as an urban district, and like neighbouring Darlaston, and Bentley, came under the direct control of Walsall Metropolitan Borough. By the late 1970s, Willenhall, and the other Black Country towns were beginning to feel the effects of industrial decline. Job losses were reported almost daily in the media, and many once successful businesses closed. The factories started to disappear, and many of the larger factories such as John Harpers, Josiah Parkes, and even Yale’s Wood Street factory, have now gone, something that was unimaginable only a few decades ago. 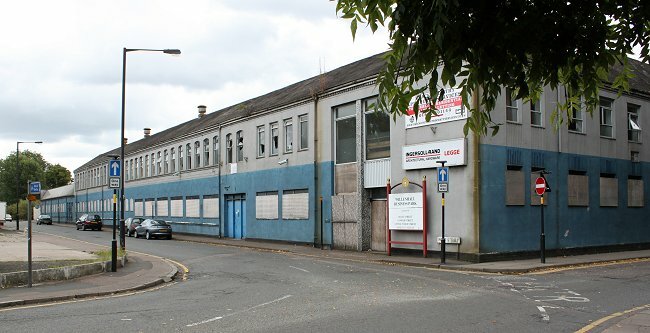 Lock manufacturing in Willenhall has almost disappeared, only a handful of skilled lockmakers now remain in business. Luckily the industry is still remembered in the form of the Locksmith’s House, in New Road. It opened in April 1987 as The Lock Museum, and has displays featuring locally made locks, one of the few remaining lock workshops, and an early 20th century lock maker’s home. 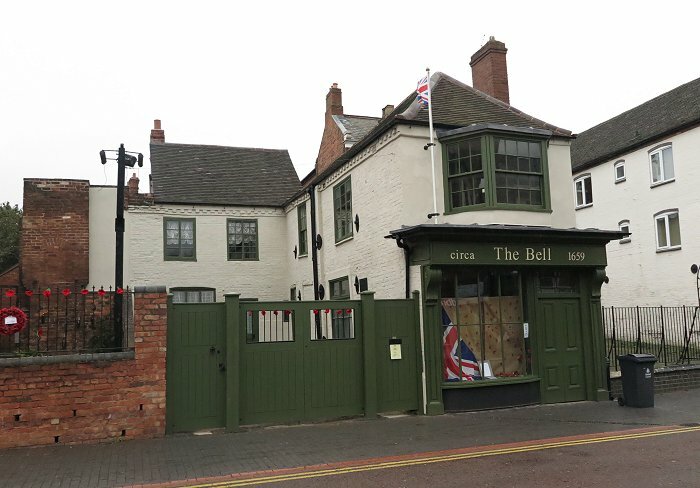 The museum suffered from insufficient funding and closed in 2002, but luckily the Black Country Living Museum took the site over, and after a lot of investment, reopened it in 2003 as The Locksmith’s House. It is the country’s only dedicated lock museum. Tom Millington and David Plant demonstrating at The Lock Museum. 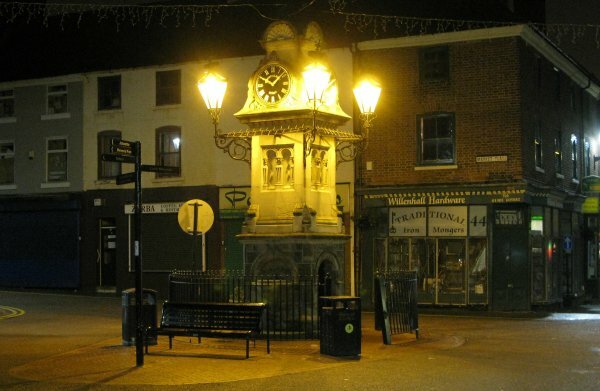 An evening view of the memorial clock in the Market Place. Taken by Richard Ashmore in the mid 1970s. 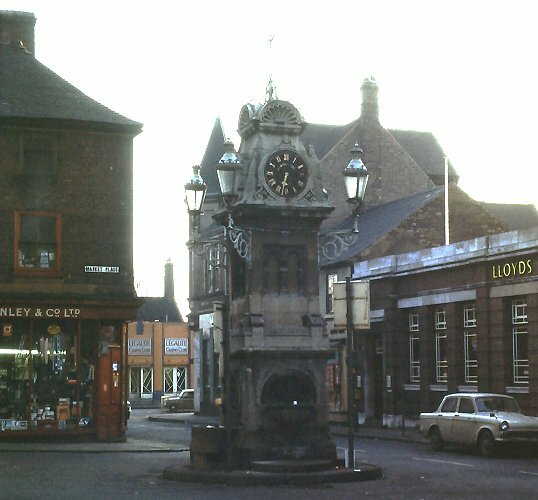 Another view of the memorial clock, taken by Richard Ashmore in the mid 1970s. 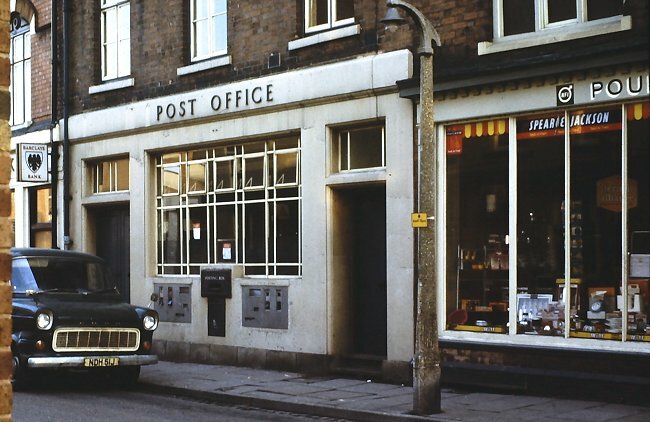 The old Post Office in Wolverhampton Street, now a chemist. Taken by Richard Ashmore in the mid 1970s. Sorting the Christmas mail at the post office. Richard Ashmore who took the previous three photographs is on the far right looking down. 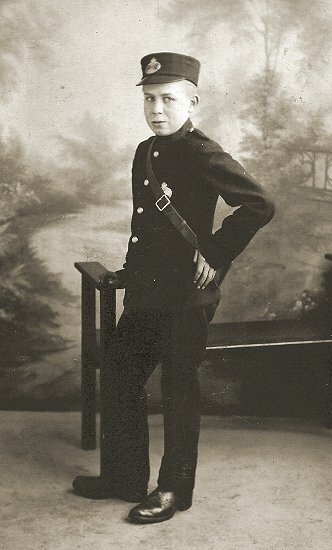 A Willenhall messenger boy, from an old postcard. 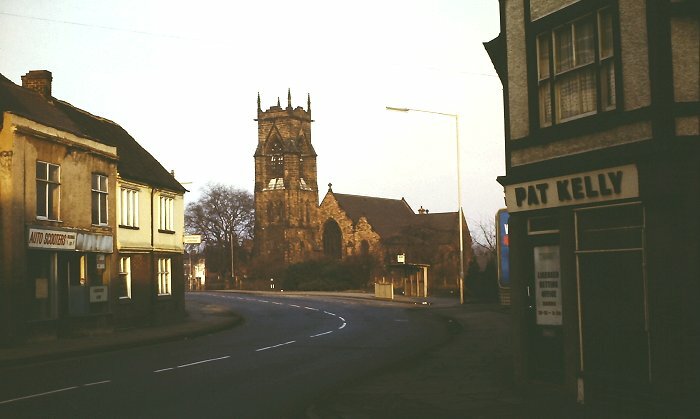 A view of St. Giles' Church from Walsall Street, taken by Richard Ashmore in the mid 1970s. 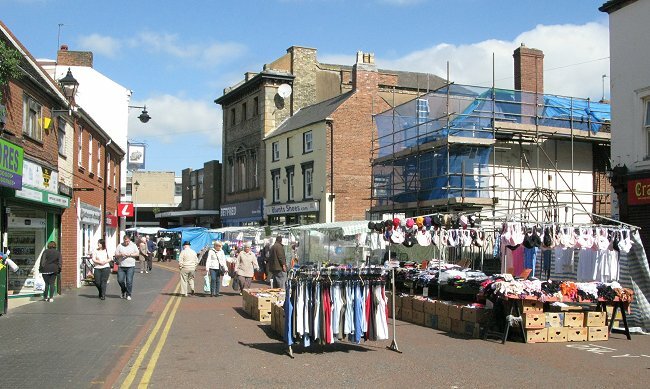 The largest development in the town centre took place in 2009 with the demolition of Yale’s Wood Street factory, and the building of the new Morrisons store, which opened in January 2010. 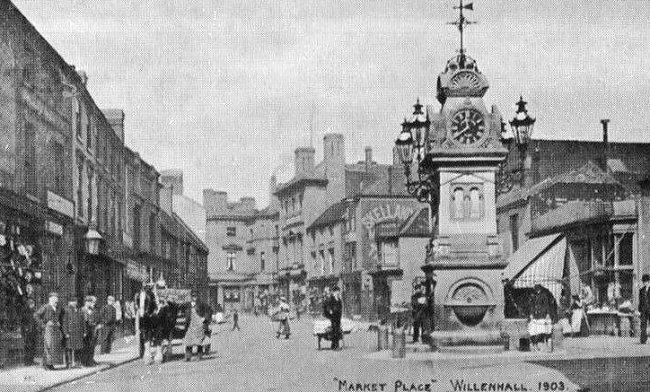 Although many changes have taken place over the last few years, Willenhall is still regarded as one of the most intact towns in the Black Country, still retaining much of its original atmosphere. Many little workshops and factories remain around the town, giving a flavour of the once successful manufacturing centre. Many of the lovely Georgian and Victorian buildings still survive, and the vibrant Market Place has kept much of its character. 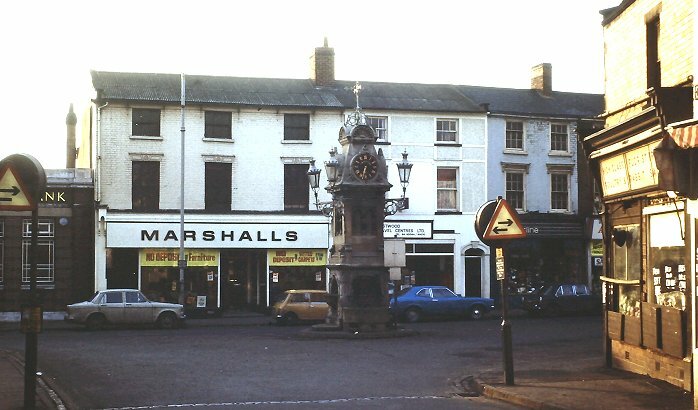 Stafford Street in the 1970s. From an old postcard. 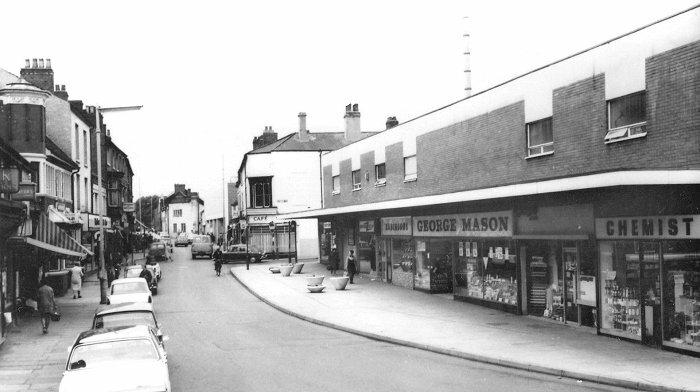 An earlier view of Stafford Street before the modern shops were built. Some of the lovely old buildings that are to be found in the Market Place. 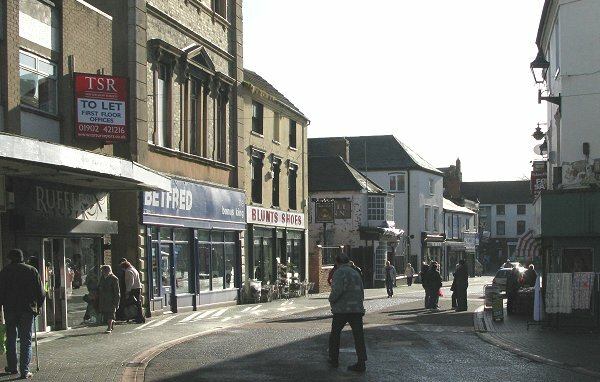 Much of the town centre is now designated as a conservation area, and so its character and charm will survive. 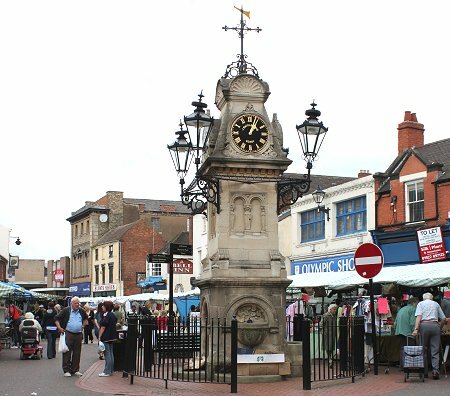 Many Willenhall people are fiercely independent, and although the town is now part of Walsall, it still retains its own identity, and hopefully will continue to do so, and continue to prosper, for years to come. 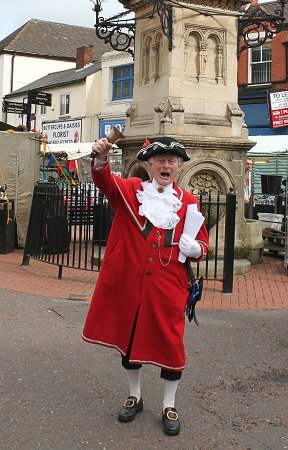 The Town Crier, Cyril Richardson, in 2010. The 81 year old began his career as a town crier in the early 1990s, and has been doing it in Walsall since the mid 1990s. On a sad note, part of the old Legge factory shown above, was severely damaged at the end of February 2011 after a mindless arson attack. The Market Place at night. November 2013. 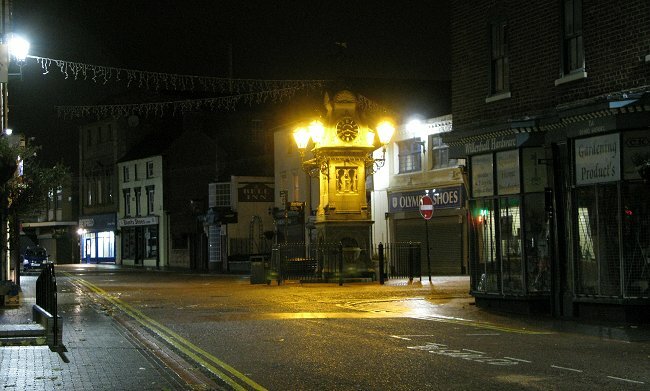 Another night time view of the Market Place. The market in April 2014. 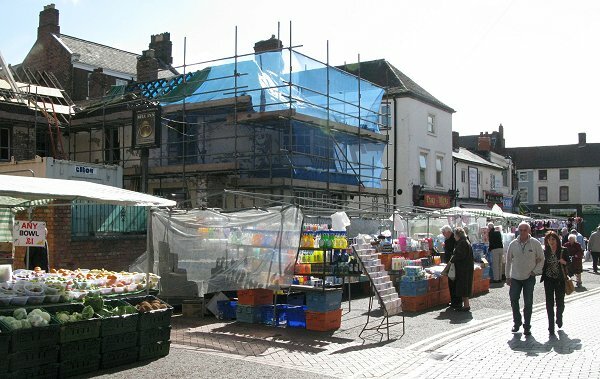 Another view of Willenhall market in April 2014.